Upgrading from Pic Scanner app to Pic Scanner Gold, and wondering how to transfer photos to the new app? It’s easy! Why upgrade to Pic Scanner Gold? Pic Scanner Gold is a much-enhanced version of Pic Scanner. If you own iPhone 6, iPad Air or newer models, you should seriously consider upgrading to Pic Scanner Gold (Here is the App Store link.) This advanced photo scanner app gives much higher resolution scans, and includes built-in editing and creative features unmatched by any other. The best part is that once you upgrade, you can transfer all your scanned photos, albums and captions from the old app to the Gold app in less than a minute. Totally automatic! There are two ways to do it. Which one is better for you will depend on how many scanned photos you have in Pic Scanner. 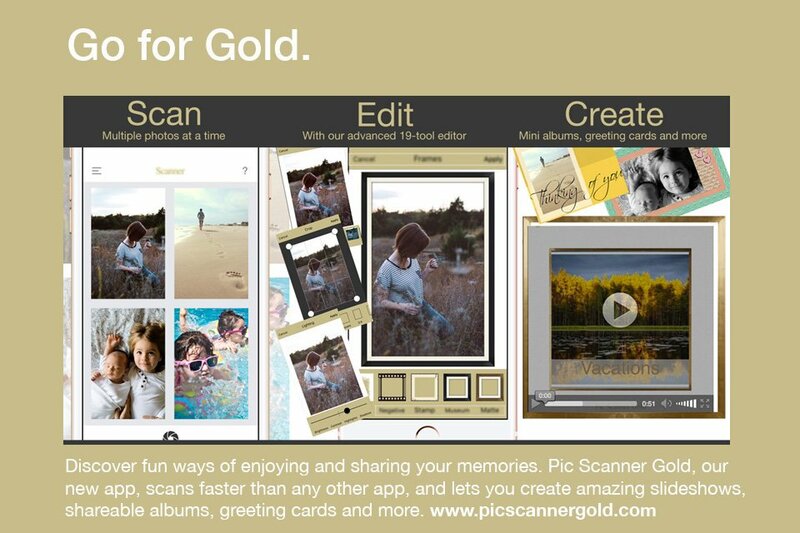 1) Download Pic Scanner Gold on the iPhone or iPad where you have Pic Scanner installed. 2) Launch Pic Scanner (old app). Tap Menu > Migrate. This will compress your scanned photos, albums and captions. After this, sharing options would be shown. Choose Pic Scanner Gold. 3) Pic Scanner Gold will open, and all pictures, albums and captions (but not Original, uncropped pics) will be saved in it. 4) Check Photo Gallery and Albums in Pic Scanner Gold to ensure everything looks good. After this, you can delete the old app to free up space on your device. Note: Some heavy users of Pic Scanner (having more than 250 scanned photos and multiple albums, and using relatively older devices such as iPhone 6 or iPad Air) MAY get an error message in trying to transfer photos with the above method. This happens if your iPhone or iPad lacks enough processing power or memory to handle such a large data transfer. If you experience this, please use the alternative method described in this post (Expected transfer time: 10 minutes). Good luck, and if you have any difficulty, please email us.